A nice picture of a cool tropical garden featuring tender exotic foliage plants. The large leaved plants in the foreground are Xanthosoma sp. 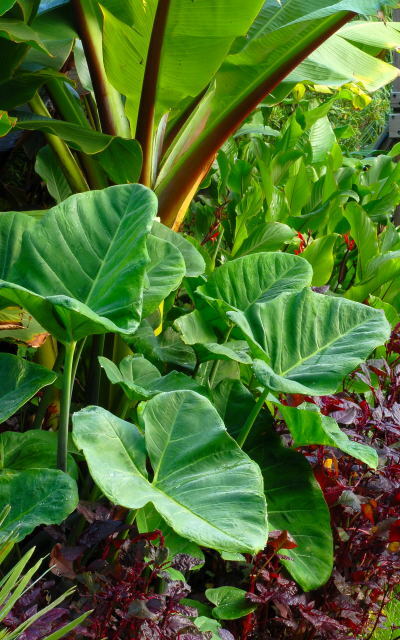 (coco yam or elephant ears) These are grown annually from grocery bought tubers. The tall plant behind with the red midribs is a seed grown Ensete Ventricosum. To the rear of the shot, seed grown canna Warscewiczii (with the red flowers) merge into a group of juvenile Ensete. With the exception of the various Abyssinian bananas all these plants are destined for the compost heap at the end of the season. This part of the garden receives high levels of sunshine (when available) during the summer and as such is used primarily to grow large leaved tropical plants.